United Continental Holdings Inc. is revamping some of its regional jets to add more first-class seats and amenities as part of a wider push to attract more business travelers. The airline’s remodeled short-haul aircraft, dubbed the CRJ550, will be an adaptation of a plane made by Bombardier Inc. that typically flies with 70 seats. 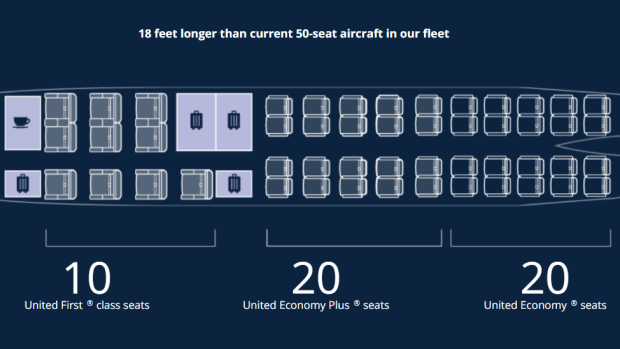 That’s 20 more than in United’s new configuration, which adds more luxury seats while reducing economy berths. United plans to fly the jets by year-end in Chicago, followed by flights from Newark, New Jersey. The upgraded regional offering is part of a broader fleet renewal at United as it races with Delta Air Lines Inc. and American Airlines Group Inc. to segment aircraft cabins for a full spectrum of customers, from lucrative business travelers to leisure passengers in the lowest-priced basic economy. United is adding more than 1,600 premium seats to almost 250 aircraft across the fleet, not just small jets. One route United is eyeing for the CRJ550 runs between Chicago and Bentonville, Arkansas, home of Walmart Inc. Both American and Delta have a dozen first-class seats on their regional jets carrying passengers from Northwest Arkansas Regional Airport to major hubs. United has older 50-seat jets, all with economy seating. United had only 7 per cent of the airport’s 22,000 premium international passengers last year, the airline said in a memo to employees. The company said it should get at least a quarter of the most lucrative customers in such connecting markets, because of its extensive international network. United expects to gain certification from U.S. and Canadian aviation regulators before the end of the year for the CRJ550 planes, which are adapted from Bombardier’s CRJ700. The airline’s pilot union said the new configuration would be a step toward remedying “universal disdain” among travelers for the current 50-seat, all-coach jets at United Express. But by cutting seats, United will also risk facing cost challenges, the Air Line Pilots Association said. “The verdict on whether this product is a short-term band aid or a long-term solution will hinge on the company’s ability to adequately make up for the revenue lost due to the removal of 20 seats, and the ability to efficiently reintroduce 50-seat aircraft into our capacity-constrained airports,” United’s ALPA chapter said in a memo to pilots. The new cabin has the potential to spur airlines to refresh their regional-jet fleets, Bombardier said in a statement. The Montreal-based planemaker said last year that it’s exploring strategic options for the CRJ program. The Chicago-based airline is overhauling the cabins of 50 of its CRJ planes flown by a regional affiliate, not buying new aircraft. Bombardier, which invented the regional jet in the late 1980s, hasn’t announced any firm orders for the CRJ700 since 2015. During the first nine months of 2018, the company removed six previous orders from its backlog, and only delivered one of the jets. Over the same period, by contrast, Bombardier booked 34 orders for the larger CRJ900s. United’s CRJ550 planes will feature Wi-Fi service and a self-service beverage and snack station for the 10-seat first class section. They also will have four storage closets, cutting down on the need to gate-check bags. The 50-plane fleet will continue to be operated by GoJet Airlines, a regional carrier owned by Trans States Airlines that also flies for Delta. United also will add four more first-class seats on its mainline Airbus SE A319 and A320 aircraft, bringing them to 12 and 16, respectively. And the carrier is boosting the size of the premium cabin on 21 of its Boeing Co. 767-300ER aircraft, adding 16 Polaris business-class seats to bring the total to 46.